December 31, 2015. “What should we do New Year’s Eve?,” is a question we wrestle with every year. The idea of being a couch potato watching celebrations on TV feels like something best reserved for when we’re in wheelchairs. And the pressure to make it a blowout evening ratchets up as the date approaches. 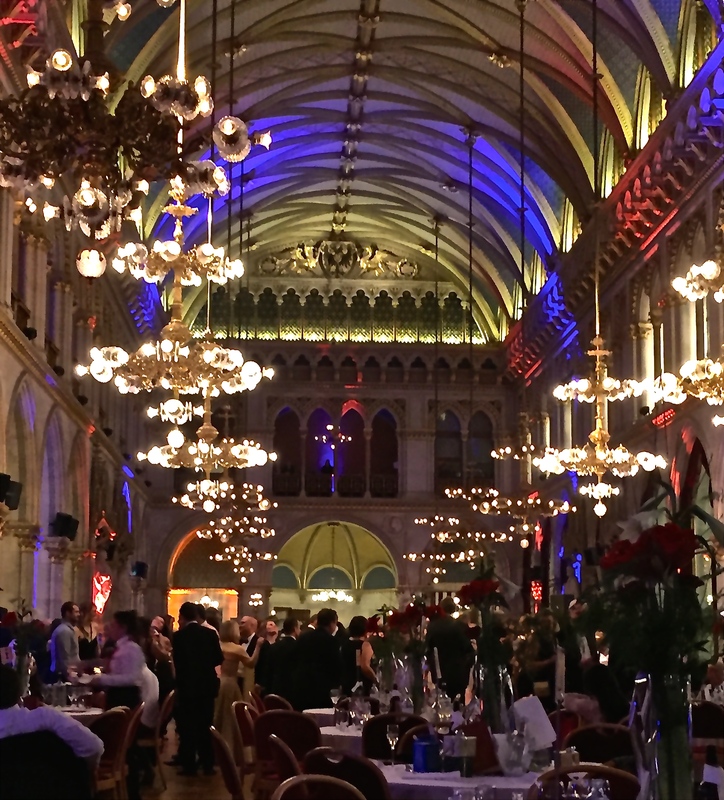 So when we discovered that Vienna offered formal balls — with classical music, the traditional Viennese Waltz, a four-course meal, and fireworks — we were sold. The party is an all-ages event, with any kind of music you might desire being blasted from dozens of different stages. 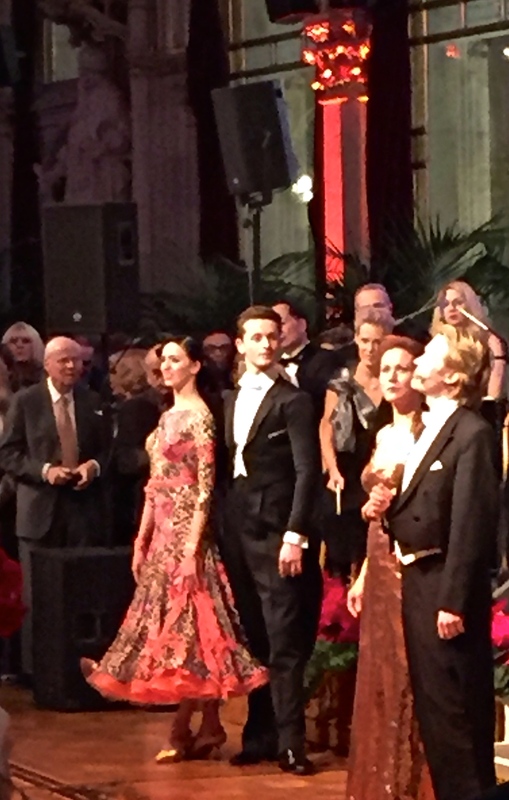 As it turns out, Vienna really knows how to bring in the New Year, far beyond just throwing a few (okay, dozens of) formal balls. Every plaza in the Old Town hosts performances, while food stalls, punsch vendors, and knick-knack hawkers line the streets in between, creating what’s known as the New Year’s Eve Trail. Not just for 20-somethings, the event attracts everyone from toddlers to great grandparents, who promenade down the boulevards eating and drinking their way into the next year. 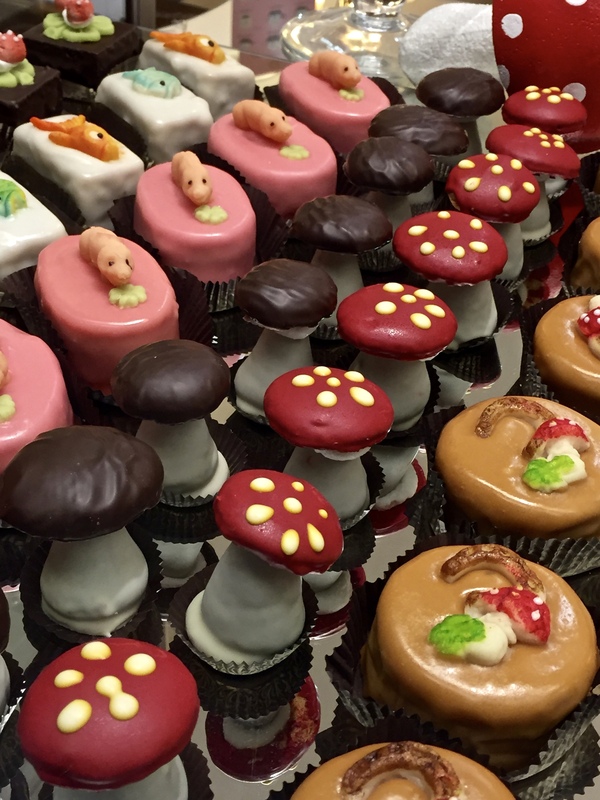 Yummies decorated with pigs, four-leafed clovers, mushrooms, and horseshoes embody good luck in the coming year. We spent the morning of the Eve doing a little shopping in preparation for the ball. (I’d forgotten my “underpinnings,” as I like to call them — elements essential to fitting in my dress after four days of gorging myself on Austrian food.) But eventually we took to the streets for the party kickoff at 2:00 p.m. Live bands, DJs, and opera singers orchestrated our progress as we snacked our way along the New Year’s Eve Trail, from bakery to bakery, eating every adorable marzipan confection to be had. And of course, we sipped countless cups of punsch, toasting equally lubricated strangers with “Prosit Neujahr!,” the traditional New Year’s salutation. It’s just not New Year’s Eve without a glass of punsch in your hand. We finally finished off the afternoon browsing stalls full of tchotchkes and photographing the incredible number of good-luck paraphernalia for sale. It’s astounding the amount of charms, blinged-out houseplants, goofy hats and glasses, balloons, and other oddities that people feel they can’t live without after a few cups of punsch. As we strolled, we peeped into various hotels to watch staff setting up for the evening’s events — and discovered that many of the baubles from the streets had made it onto the supper tables as part of centerpieces or party favors. Seeing fun little traditions like this is probably one of my favorite things about traveling in another country during a holiday season. Get you’re pig charms here, folks! Looks like the trinkets have a place at the dinner table. This little guy doesn’t look too thrilled about being the bearer of good luck. Who doesn’t need a tinseled houseplant? We woke up to find that our hotel had decorated with these cute little tuxedoed-and-top-hatted guys. A New Year’s centerpiece that takes a more nature-themed angle. The New Year’s Eve party display at our hotel. 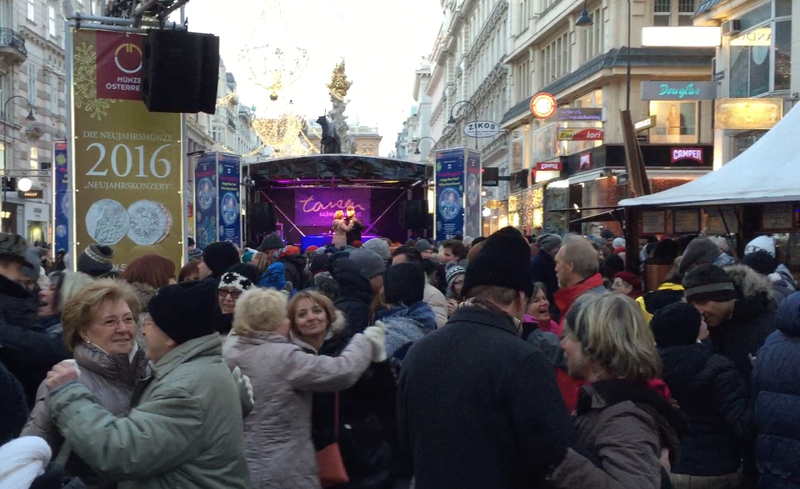 Matthew and I brushed up on our waltzing skills with a crash course in the streets of Vienna. Perhaps the best moment of the street scene came when we joined the crowd in a waltz lesson. From a nearby stage, a couple demonstrated the steps and called out instructions and encouragement to the inebriated masses. Everyone obligingly galloped along, wincing and laughing at the numerous collisions and squashed toes. While some of these may have been alcohol induced, at least the liquor had a numbing effect on the pain. 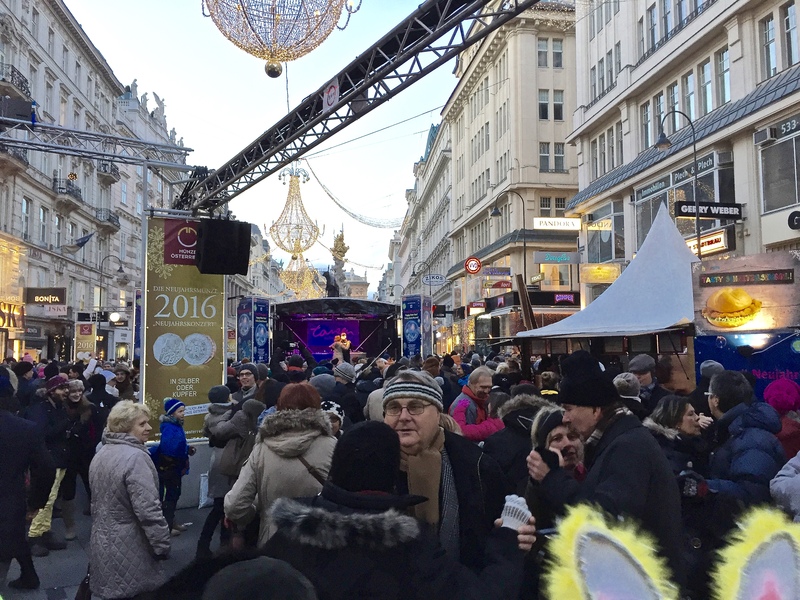 Really, there’s just no better way to spend New Year’s that whirling to the strains of “Schnee, Schnee, Schnee” (Snow, Snow, Snow) beneath the winter skies of Vienna as the flakes drift down. Okay, time for totally random word association. 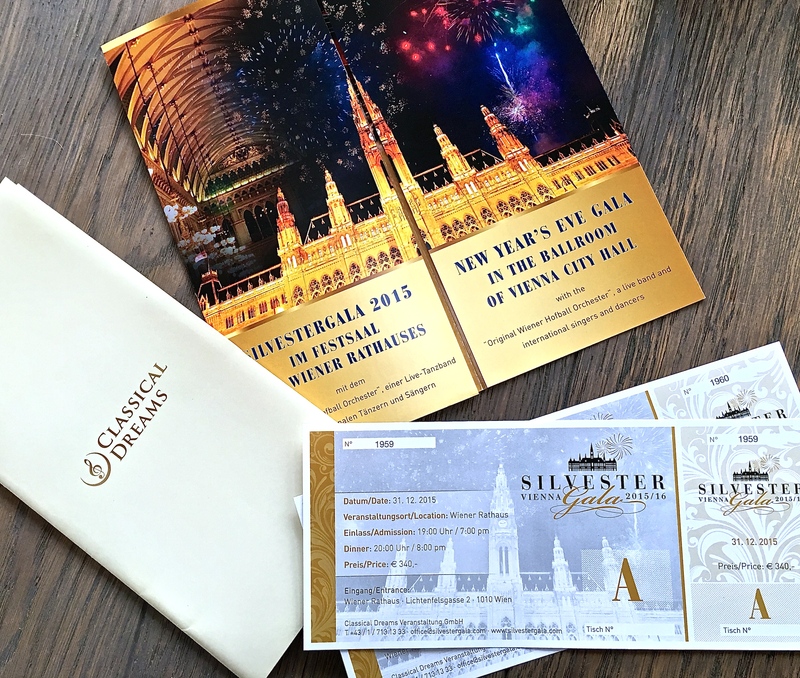 In German, New Year’s Eve is “Silvester” and City Hall is “Rathaus.” Is it just me, or don’t these words together conjure up visions of Looney Tunes’ Sylvester the tuxedoed tomcat and his mousy nemesis Speedy Gonzales? Maybe I’ve had too much punsch. We managed to tear ourselves away from the street-side revelry by about 6:00 p.m. to begin preparations for the ball. 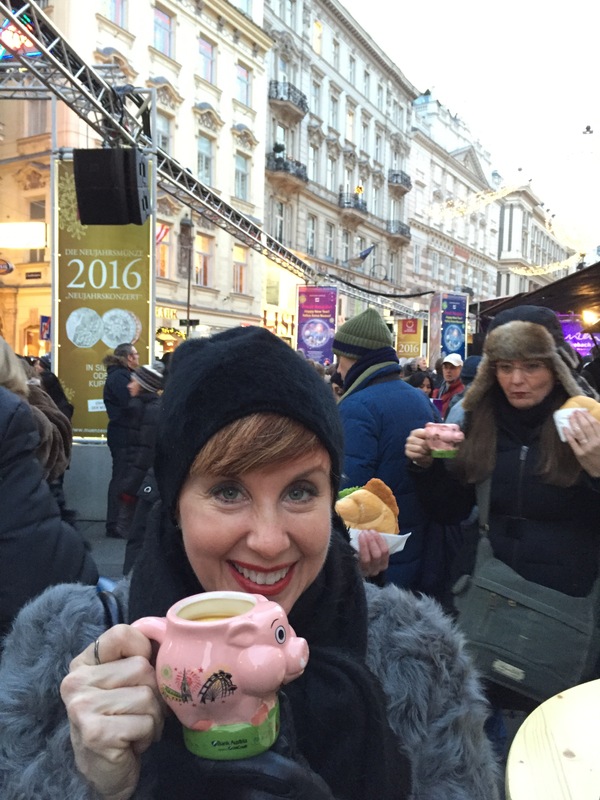 From the many online ticket options we’d perused at home, we’d selected the soiree being held at Vienna’s Rathaus (which means “City Hall” — not rodent-infested house.) Galas aren’t cheap dates, by the way. But consider that most are held in jaw-dropping palaces, offer a four-course meal and full bar throughout the night, feature a variety of performances, and are topped off by fireworks. We figured this was a once-in-a-lifetime chance, so we decided to plunk down some serious coin for the experience. Sure is nice to get some additional mileage out of a tux and ball gown. 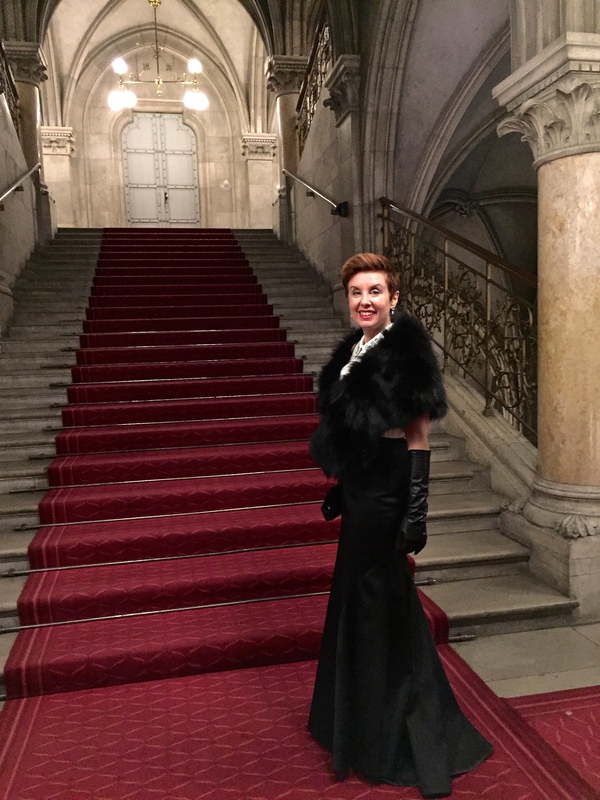 One additional expense to budget for if you decide to attempt a Viennese New Year Gala: full evening dress is required. Luckily, we saved a bit of cash by recycling our formalwear from the Marine Corps Ball we’d attended back in November. But even armored in our finery, we still worried that we wouldn’t fit in. Butterflies fought for territory in my stomach as we walked City Hall’s red carpet, where ranks of white-coated waiters lining the entryway offered us cocktails from silver platters. 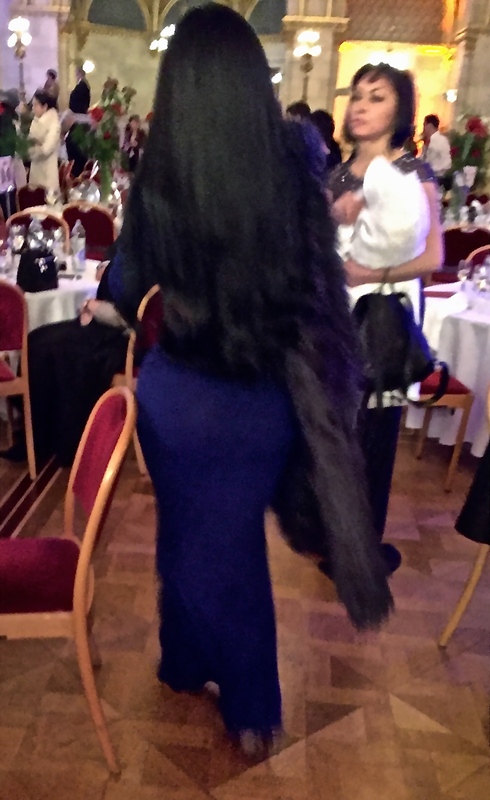 The Kim Kardashian lookalike — from behind, of course. We needn’t have worried, however. Moments after we entered, a couple who’d decided to impersonate Kanye West and Kim Kardashian sashayed into sight. (Kim’s doppelgänger even came complete with the mandatory, surgically-implanted flotation devices both fore and aft.) Another lady helmeted by a blonde bouffant ‘do and adorned in ruffled peach chiffon looked exactly like Eva Gabor from Green Acres. Clearly, blending in wasn’t necessarily the end goal for lots of folks, so we relaxed a bit. Check out the gorgeous Neo-Renaissance ballroom of City Hall, built 1872 – 83. We eventually found our seats, only to discover that the gala planners had done their homework. Maybe I’m giving them too much credit, but it seems that they may have made use of our computer’s IP address (Norwegian) and our home address (U.S.) to create table assignments. The couple on our right turned out to be a Norwegian father and daughter, while the rest of our fellow diners hailed from Texas. Coincidence? Mmm, probably not. Sharing English as a common language, plus an affinity for red wine, helped break the ice while we chatted over supper. As to the particulars of the food, I wish I could give you details. I hazily recall a delicious soup, a fabulous filet mignon, and something chocolate for dessert. But with five bottles of wine downed amongst us during dinner, and the fun floorshows sandwiched between courses, all I can remember is that the meal was yummy. 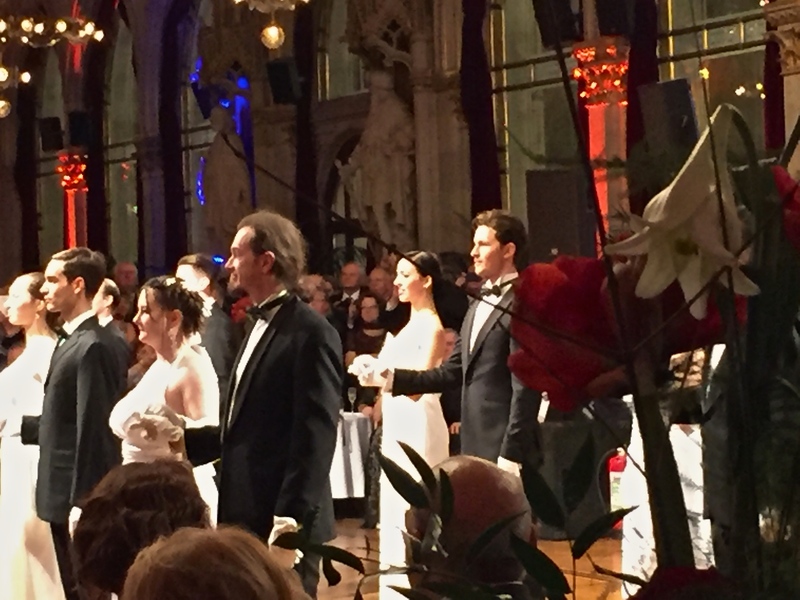 And the music was terrific — the Vienna Hofball Orchestra serenaded us with a medley of waltzes while we ate. Speaking of the entertainment, our Master of Ceremonies for the evening was quite a fascinating character. A mane of silver hair and an eyepatch accessorized his tux, and he introduced each new segment in four different languages: English, German, Italian, and French. At one point, I swear he broke out into Japanese. Consider me one terribly impressed monoglot. Time to break out my French Rosetta Stone DVD’s again. 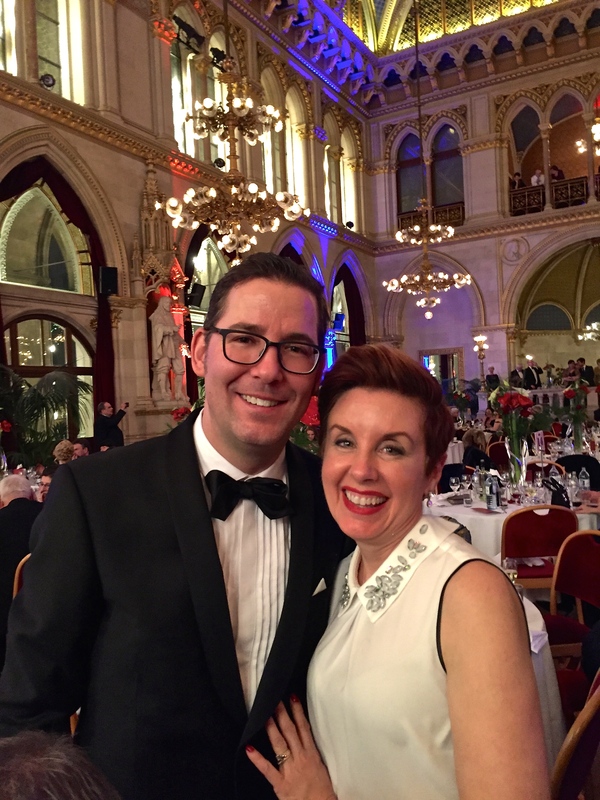 Anyway, as our host explained, Vienna’s Ball Season kicks off at the end of November, but gets really rollicking in January and February as the sobriety of Lent marches inevitably closer. More than 450 formal balls celebrate Carnival, with most Viennese typically attending at least one event during the winter — usually the gala associated with their profession, such as the Doctors’ Ball, the Lawyers’ Ball, or the Coffee-house Owners’ Ball — or perhaps an event organized by hobbyists, such as the Jägerball (Hunters’ Ball) or the Weightlifters’ Ball. Yeah. I’m still trying to wrap my head around the idea of a bunch of beefy Arnold Schwarzeneggers mincing delicately across the dancefloor to a polonaise. Kids are expected to learn the requisite steps at dance schools and then display their mastery before a gala audience as part of their formal launch into society. Which is why our opening ceremony commenced with a performance of some traditional Viennese dances — a quadrille and a waltz — by the Rueff Dance School. The couple on the right sang famous arias from operettas, while the couple on the left demonstrated the fancy footwork of the Viennese waltz. 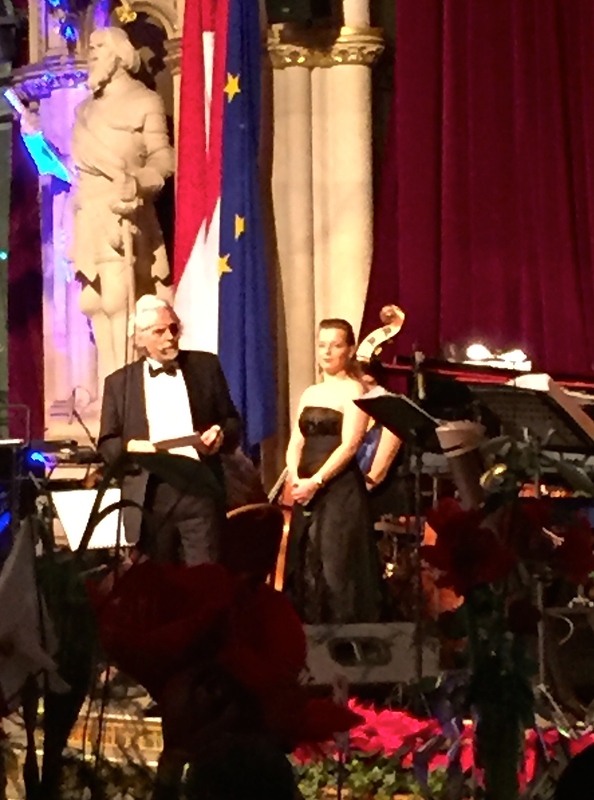 The next interlude consisted of highlights of Viennese Operetta performed by renowned international soloists. And as if that wasn’t enough, the current World Champions of the Viennese Waltz twirled about the ballroom while the performers sang. But wait, there’s more. As a special surprise, a terrific all-female group whose name I sadly can’t remember did a medley of different pop songs … on violins. It reminded me a bit of “Hooked on Classics;” does anyone else remember that blast from the past, when the Royal Philharmonic Orchestra put a disco backbeat to the greatest hits from the 19th century, like Beethoven’s 5th? Fun to dance to, and a clear attempt to get the young’uns interested in classical music. The throngs of revelers spread out below us from the balcony of City Hall was pretty impressive. Towards midnight, waiters again circulated to distribute glasses of champagne and encourage us to toddle out to the balcony overlooking City Hall Square. Tens of thousands of people clogged the plaza below. Little rectangles of glowing light from cell phones lofted high reminded me of the days when folks used to raise their lighters in tribute at a rock concert. 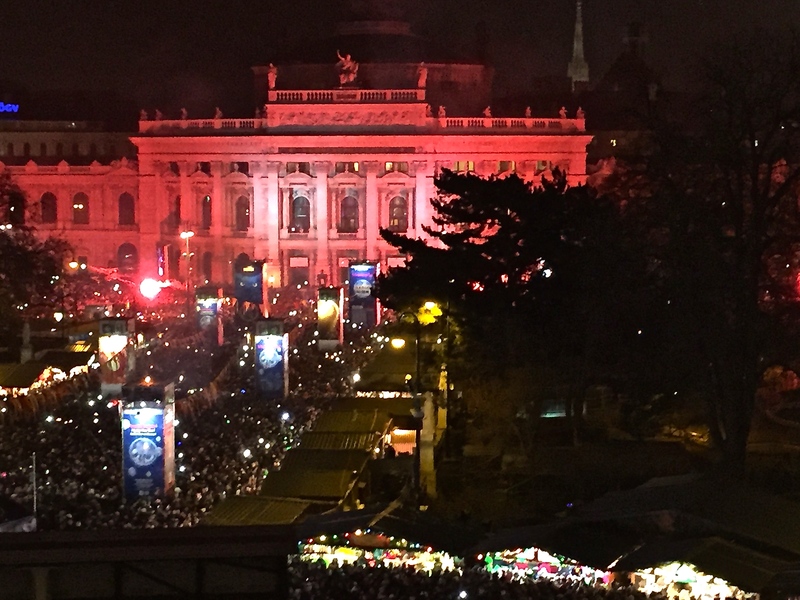 Today’s showing signaled that more than half the crowd hoped to participate in Vienna’s attempt to break the world’s record for largest mobile phone firework display. The dance lessons in the square must’ve paid off — no casualties during the Blue Danube Waltz. After oohing and aahing at the light show and listening to the bass punctuations of St. Stephen’s Pummerin (“Boomer”) ringing in the New Year, we headed back inside where we floated around the ballroom to the strains of the Blue Danube Waltz, traditionally danced at midnight on New Year’s Eve. You know the song. Remember the ubiquitous ice-skating rink tune? Or the Bugs Bunny episode where Elmer Fudd is the orchestra conductor, and Daffy Duck saves the day as the ugly duckling? Gotta love Merrie Melodies cartoons for popularizing classical music. 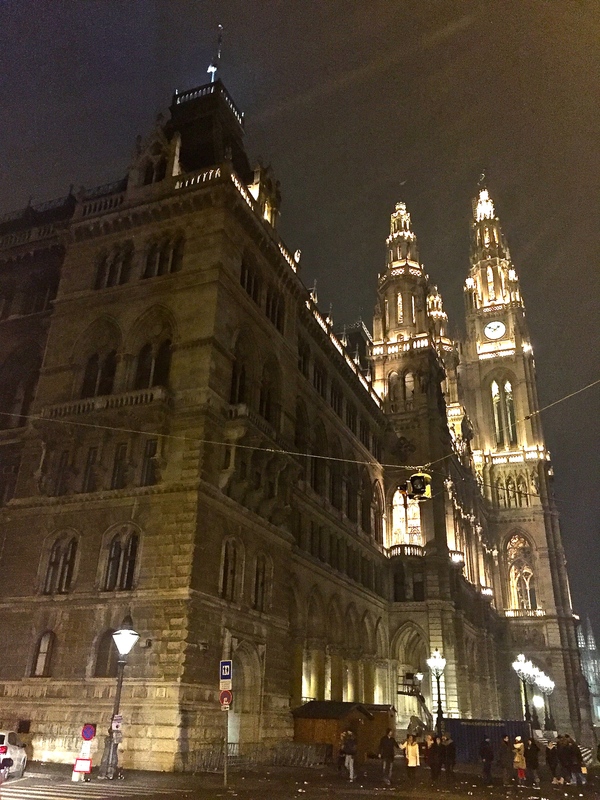 Beneath the Neo-Gothic towers of Vienna’s City Hall a few stragglers prepare to stumble home after New Year’s. Next, we partook of a traditional cup of creamy lentil soup to fortify ourselves for more dancing. A live group began playing typical wedding-band favorites such as “YMCA” and “Celebrate,” which proved to be enormous crowd pleasers but somehow offended our our Texan tablemates, who vacated grumpily. Finally at about 2:00 a.m., we staggered back to our hotel for a short nap before our 6:00 a.m. flight. Never say we don’t know how to party like rock stars. I just received and read your post below. Wow! You and Marthew sure do know how to celebrate the New Year! Wonderful. I’m sure you made everyone want to go to Vienna. Count me as one of them. But for now I am very happy to be in Malmo. Oscar and Elton are adorable, I will miss them after Wednesday. I won’t return before the fall and they definitely won’t come to Chicago until summer next year. Such is life. Will you go to Morocco for Easter? It may be a very good idea while it is still possible…. After the latest events, Turkey clearly is out. What a sad world we now live in… If you do go, there is little time to prepare but I suggest getting accommodation through Booking.com. I’ve been very happy with them. And book a good Riad in the old town.